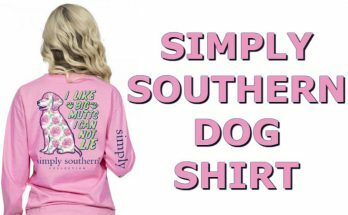 Simply Southern Tees just came out with new long sleeve designs for fall of 2018. 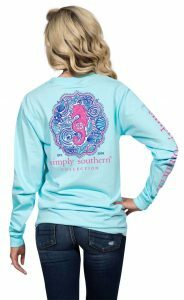 Even though we know it is still summer time, we thought we would give you a preview of some of these awesome preppy Simply Southern long sleeve shirts. 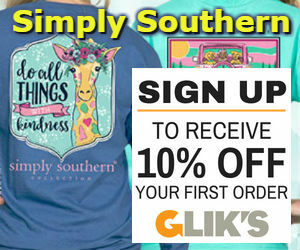 Click Here to see all of our Simply Southern Items. Most of these t-shirts designs are available now for purchase. 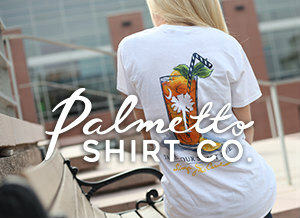 Simply Southern has done a wonderful job of keeping their designs fresh and new. 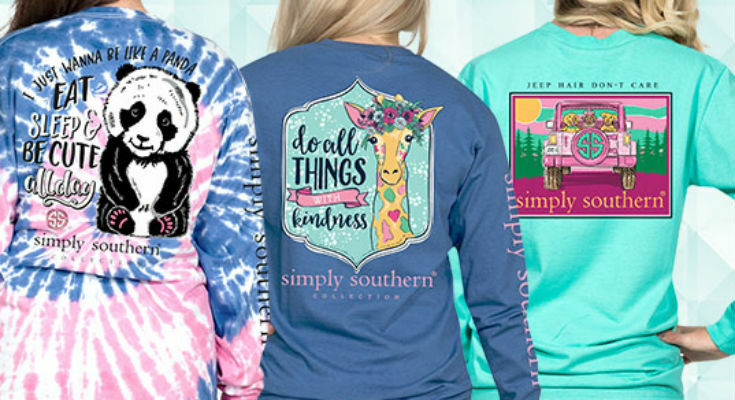 Some of the designs listed below have a panda, lantern, jeep hair, giraffe, pineapple, seahorse, and elephant incorporated into the design. 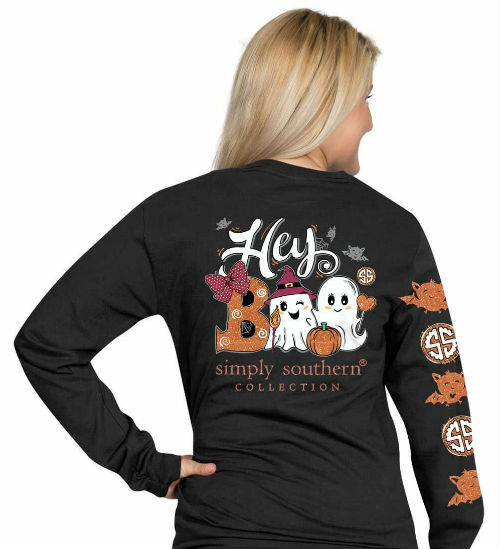 These long sleeve designs are just a start of what Simply Southern will be coming out for fall and winter of 2018. So make sure you subscribe to our newsletter below to be notified of all the new designs coming out. Be on the look out for their fall harvest designs shirts and Christmas designs shirts. These t-shirts will be awesome. 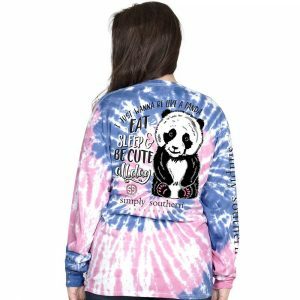 You will love this new long sleeve tie dye t-shirt. It features a cute panda with the saying, I just wanna be like a panda – Eat Sleep & Be Cute All Day. The tie dye shirt gives it a colorful image for late summer and early fall time. This is a perfect grey long sleeve t-shirt for fall. Has a fall look with an image of a lantern with the saying, Be A Light For All To See. This is a new tee with a great saying on it. Here is a new hair don’t care t-shirt. 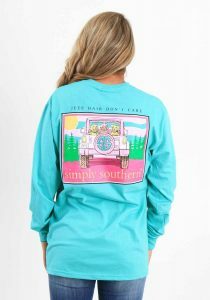 This long sleeve tee has an image of a jeep with dogs in the back with the saying, Jeep Hair Don’t Care – Simply Southern. This t-shirt will be a great addition to you hair don’t care t-shirts. 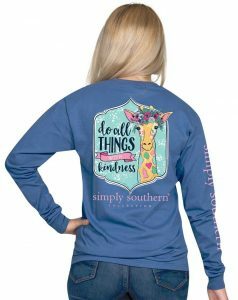 If you love giraffes, then you will love this new Simply Southern t-shirt with an image of a giraffe on it with the saying, Do All Things With Kindness. This would make a great gift for a friend. If this saying describes you, then you will love this t-shirt. 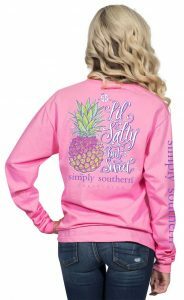 The long sleeve tee has an image of a pineapple with the saying, Lil Salty But Sweet. With the pink color tee, this t-shirt would be great during a late summer evening. This is a great looking seahorse design tee shirt. 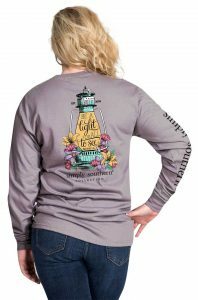 The beautifully design on the back of the tee goes perfect with the marine color long sleeve tee. 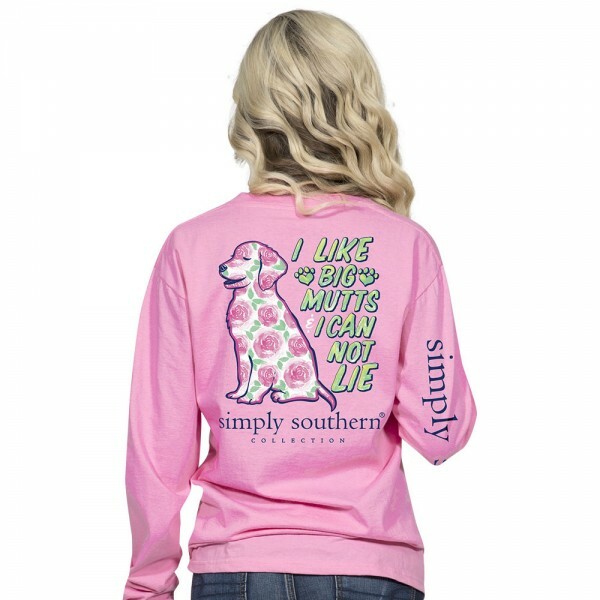 As with most Simply Southern long sleeve t-shirt, this t-shirt has a saying down the sleeve. 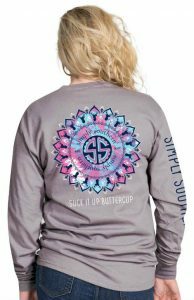 Keep your preppy and out going attitude with the cute Simply Southern tee. 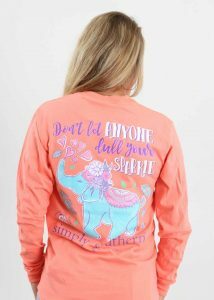 The t-shirt has an image of an elephant with the saying, Don’t Let Anyone Dull Your Sparkle. 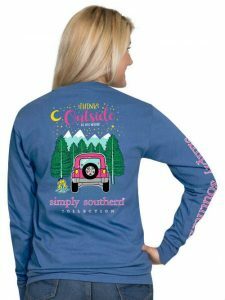 This is a beautifully preppy blue moonrise color long sleeve tee. This t-shirt has a awesome turtle design on the back of the tee with the saying, Stay Classy Prep Hard. 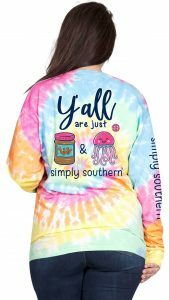 This is a adorable t-shirt by Simply Southern. I you love dogs and love to text on your phone, then check out this long sleeve t-shirt. The back of the t-shirt has an image of a puppy with the saying, I Wish My Dog Could Text Me. This would make a perfect gift for anyone who are close with the dog. This shirt is available you adult and youth sizes. 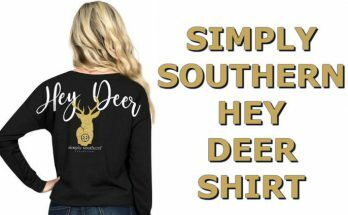 For all of you girls who like the outdoors, then check out this outdoor t-shirt by Simply Southern. It features a image on the back of the tee with a jeep in a outdoor mountain area with a camp fire. The saying on the t-shirt says, Think Outside – No Box Needed. This is a perfect long sleeve shirt for those who love to camp outdoors. This t-shirt is available in adult and youth sizes. This is a unique design that has a colorful pattern design to it. It features a buttercup flower on the back of the t-shirt with many different colors coming out of it. It has small deer heads inside the pattern. This buttercup pattern is unique and will be perfect to wear to the fall season. This t-shirt is available in adult and youth sizes. 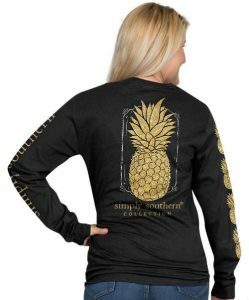 If you are in search of a black long sleeve t-shirt, then take a look at the pineapple design t-shirt. If has an image of a big pineapple on the back of the t-shirt. It also features small pineapples down one side of the sleeve. The gold pineapple really stands out good with the black shirt. The shirt is also available in adult and youth sizes. Do you enjoy a peanut butter and jelly sandwich? 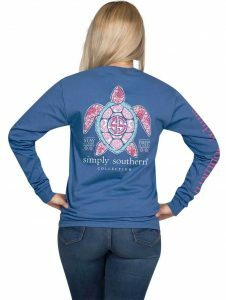 Then check out the long sleeve Simply Southern t-shirt. It features a tie dye design t-shirt. On the back of the shirt has an image of a peanut butter jar and a jelly fish. The back of shirt says, Y’all Are Just. This shirt is available in adult and youth sizes. 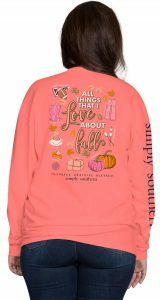 These Simply Southern Long Sleeve Shirts above are just a sampling of what Simply Southern has to offer. 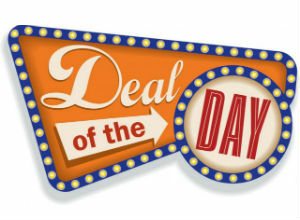 They have a big selection of short sleeve, long sleeve, youth shirts, bags, purses, caps, and many other preppy items. 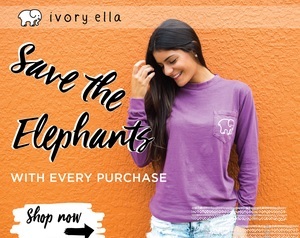 The also have two side brands of t-shirts, Save The Turtles and Country Chick t-shirts. 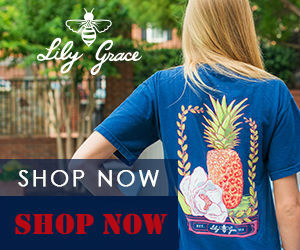 To see all of what Simply Southern has to offer click the “Shop Now” button below.